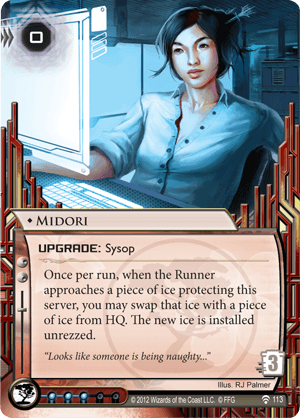 "Looks like someone is being naughty…"
Midori is an interesting tech right now. You can use her to block cutlery attempts, especially against the second or deeper ICE on a server. As was commented to the earlier review, she can also very easily block any Parasite + Datasucker plays - just rez her when they play the parasite if it's the outermost ICE. Now they have to wait until Parasite kills the ICE naturally rather than make the sucker play. Against Clone Chip you have to prerez so there is no surprise factor, but just discouraging the attempt might be enough to get a scoring window. She also shuts down Surfer + Paintbrush completely. You can rez her in the window after they paint your ICE barrier. If surfing was the runner's only plan, Midori locks the remote and throws away the key. As commented to the previous review, she can make positional ICE more useful. You know what she's also good with? Grail ICE. That's a real living wall right there. With grails you always have different types of ICE in hand, and you can just screw the runner every time they don't have their full rig - and grail ICE has a bite. Sure, you lose the credits you spent to rez the ICE you replace, but if it lands you a couple of Lancelot or Merlin shots it's probably worth it. Of course a lot of players are just running a certain totally balanced AI breaker... but Midori can drop a Swordsman or Komainu out of nowhere too. "Oh, I see you just want past my TL;DR to spoon my Merlin? Here, have a Komainu!" Does all this make her playable outside of jank? Maybe not. If her ability was a paid ability then the surprise factor might be worth it, but now runners can always jack out after you rez her. She simply has not seen a lot of use yet, and that is probably because prickly ICE or even threatening ICE simply isn’t common enough yet to really make her powerful. Having to rez that piece of ICE is an additional cost as well, but at least Midori is free to rez. What she does do extraordinarily well is advance the shell game. That ICE could be anything. It could a simple trap that just is dealt with, or it could be a piece of ICE the runner won’t have the breaker or the money to deal with, leading to a very tough decision - does the runner jack out? (Her ability triggers during 2.0, the approach - meaning she has to already be rezzed before the run starts if it's the first piece of ICE, or she can only affect the second piece onward - and the runner can choose to jack out at 2.2) That insecurity of what is there ahead of them can be the key to bluffing away a lot of runners.